Volunteers were called to a multi car crash on 441 last night by the Wegmans Plaza. 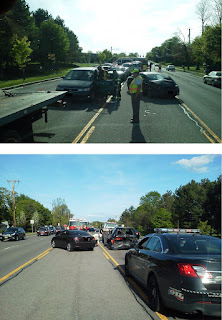 Arriving units found a four car crash with one victim who could not exit the vehicle do to the crumpled vehicle. Firefighters used a Hurst Maverick tool (aka Jaws of Life) to free the victim. Volunteers were out for about an hour with the crash scene.